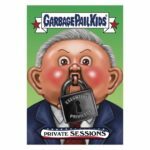 The results are in for Wednesday’s online GPK cards and sales came in lower. Today Topps revealed the print run for Garbage Pail Kids Trumpocracy 2017 cards #33-#35. 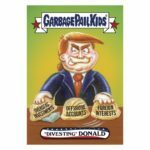 After taking a week off from the political cards, the question would be if collectors would come to purchase after the break. That ended up not being the case. All three cards finished just barely over the 100 card mark. 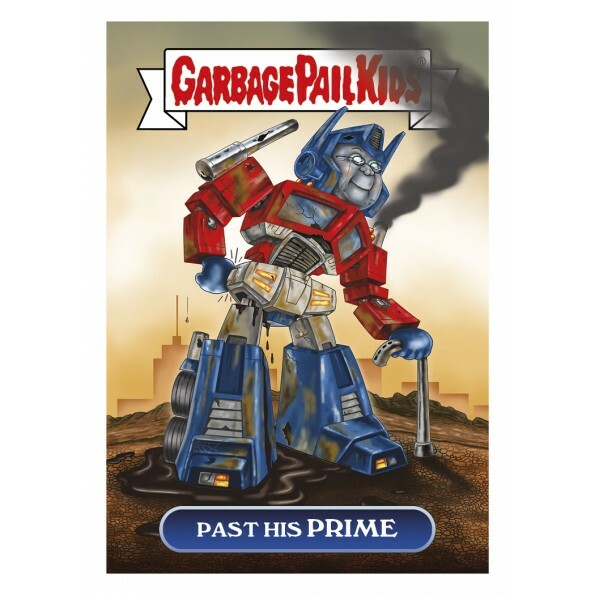 However, sales are expected to rebound a bit with Thursday’s offer of a Transformers parody. Here are how the cards from Wednesday ended up. 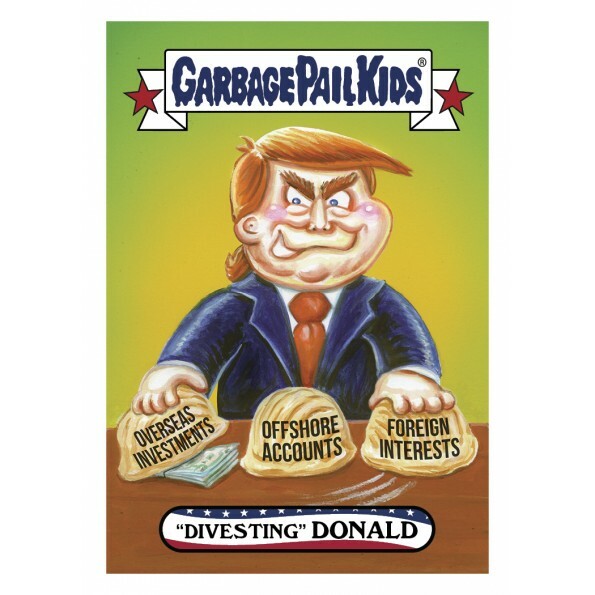 After taking last week off for Trump based GPK cards, Topps is back with a full offering of daily political cards. 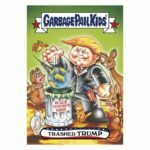 Today Topps launched Garbage Pail Kids Trumpocracy 2017 cards #33-#35 (Artist #33-#34 – Barnard, Artist #35 – Camera). Topps also is offering two Network Spews Wacky Packages cards today. Each of today’s cards can be purchased for $9.99 or in lots of 5 for $29.99, 10 for $49.99, or 20 for $79.99. 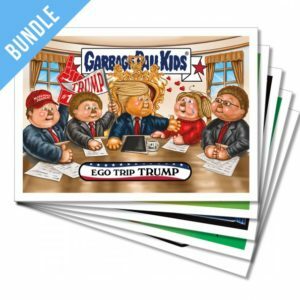 A five card bundle featuring one of each card is available for $34.99. Free shipping is available in the US via the SmartPost option, while international shipping is $10. The cards will be on sale for 24 hours via topps.com. Topps will reveal the print run at the end of the sale. Here are pictures of today’s cards. Two new GPK cards are part of today’s online exclusive cards offered by Topps. 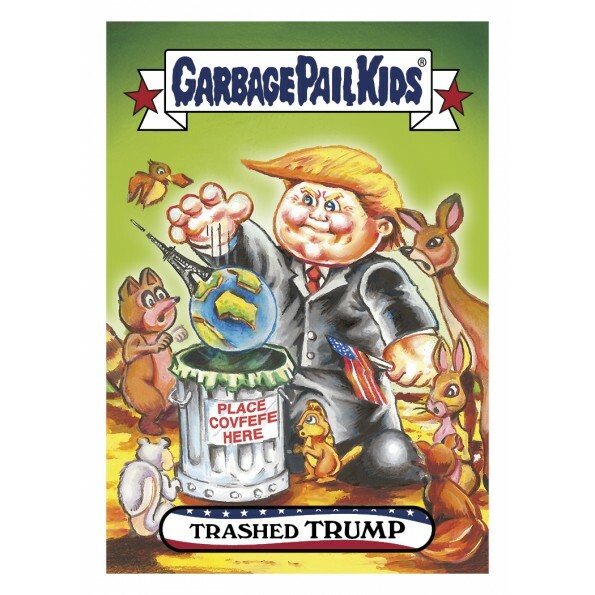 Today Topps launched Garbage Pail Kids Trumpocracy 2017 card #30 (Artist: Zapata) and GPK Network Spews #77 (Artist: Michael Barnard). They are also offering one Trumpocracy and two Network Spews Wacky Packages cards today. 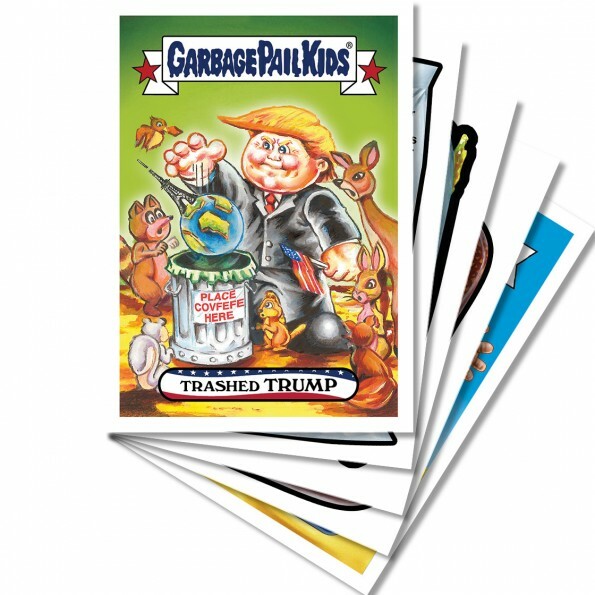 Topps looks to have turned more to Wacky Packages lately as they are outnumbering the GPK cards again. Each of today’s cards can be purchased for $9.99 or in lots of 5 for $29.99, 10 for $49.99, or 20 for $79.99. A five card bundle featuring one of each card is available for $34.99. Free shipping in the US is available via the SmartPost option, while international shipping is $10. 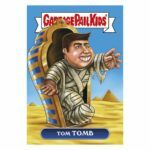 The cards will be available on topps.com for 24 hours. Topps will reveal the print run at the end of the sale. Here are pictures of today’s cards. Topps wrapped up the week with sales numbers for the rest of their online offers. Today Topps revealed the print run for Garbage Pail Kids Trumpocracy 2017 cards #26-#27, and GPK Network Spews card #74. 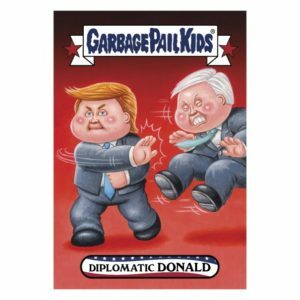 The lone GPK card offered on Wednesday saw sales spike, and led the way with 230 sold. 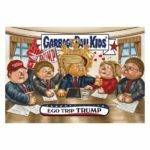 Artist Fred Harper’s return to GPK on Thursday also did better numbers than we’ve seen recently. Overall online sales were much better that last week and even into this week. With Topps on a rebound they are sure to load up next week’s releases. Here are the final numbers from the cards offered Wednesday and Thursday. Topps has been slightly delayed in revealing print run information recently. 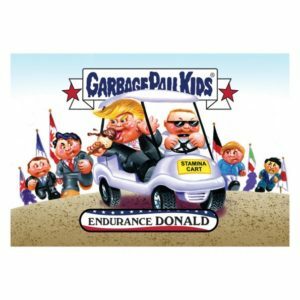 Today Topps revealed the print run for Garbage Pail Kids Trumpocracy 2017 card #25, and GPK Network Spews #71. 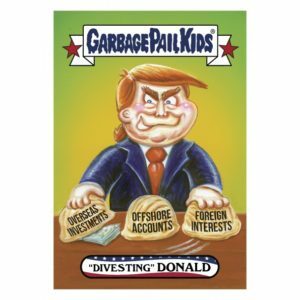 These cards were offered on earlier this week, on Tuesday. While artist Michael Barnard’s first card last week led the way in sales, numbers for his second effort were down. Historically, GPKs are hand painted before being transferred into digital form for printing. In what might be a preview for how things are done in the future, Barnard uses an all digital approach to his pieces. Collector reactions have been mixed, but credit Barnard for trying something new in the brand. Sales for his pieces will be interesting to follow going forward. Here are on Tuesday’s cards ended up.